Volkswagen continues to find ways to squeeze more power out of its engines, gasoline and diesel alike. For 2016, the Volkswagen Jetta will be powered by this automaker’s all-new gasoline engine, a turbocharged, direct-injected powerplant displacing at just 1.4 liters. The new 1.4 liter engine will replace two gasoline engines: a naturally aspirated 2.0-liter four and a 1.8-liter turbocharged four. Both gas engines have long been available in the Jetta, but will give way to the new engine as part of Volkswagen’s engine downsizing effort. Diesel and hybrid variants of the Jetta will continue. The EA211 four-cylinder engine features lightweight aluminum construction and brings in an integrated exhaust manifold as well as a toothed-belt drive for its double overhead camshaft valvetrain making use of variable intake and exhaust timing. It retains the 82 mm (3.23 inch) cylinder spacing of the outgoing engine and measures 2.93 bore x 3.15 stroke. That change provides an improved platform for increasing torque through direct induction, such as turbocharging or supercharging. With a 10.0:1 compression ratio, the new engine makes an estimated 150 horsepower at 5,000 rpm and 184 foot-pounds of torque at 1,400 rpm. Those numbers compare favorably to the 1.4-liter turbocharged engine powering the 2016 Chevrolet Cruze. Indeed, the Cruze’s motor is SAE-rated at 153 horsepower and 177 foot-pounds of torque. Volkswagen will pair the EA211 engine with a standard five-speed manual transmission or a six-speed automatic transmission. 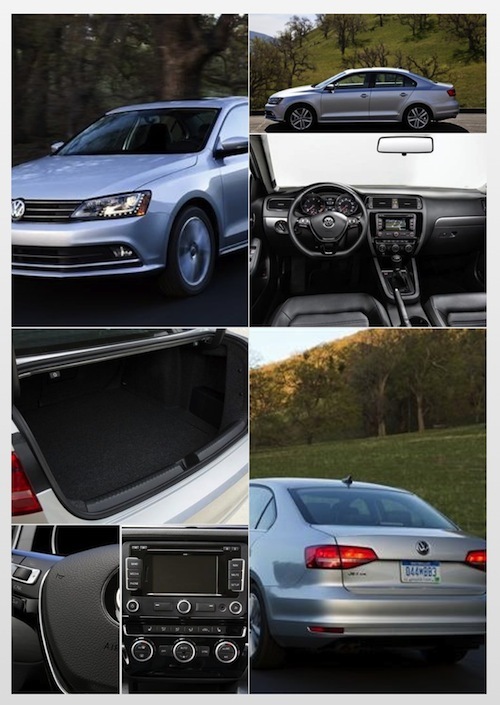 The automatic transmission is expected to help the Volkswagen Jetta achieve 39 mpg on the highway. That figure compares to the current 37 mpg for the 1.8-liter turbo and 34 mpg for the 2.0-liter four. The Chevrolet Cruze achieves 38 mpg, although a Cruze Eco model is EPA-rated at 42 mpg. Just as Volkswagen releases a new engine, the world’s largest car manufacturer (by sales through the first half of 2015), is making other changes in an effort to stoke its weak US sales. Undeniably, its most consequential move for 2016 as far as technologies go may have to do with its self-described democratization of its high-end driver assistance features. Specifically, Volkswagen will make available adaptive cruise control, front assist (forward collision warning and autonomous braking), blind spot monitor with rear traffic alert, lane departure warning, parking steering assistant, park distance control and automatic post-collision braking to more models. Thus, the Volkswagen Beetle, CC, e-Golf, Golf, Golf GTI, Golf R, Golf SportWagen and Jetta will offer these features, depending on the trim level. What’s significant about this move is that such safety features were once the dominion of luxury makes before filtering to premium mainstream models. By making such features widely available elsewhere, Volkswagen throws down the gauntlet in front of its competitors. Likely, we’ll see a response from the likes of Toyota, Ford and Honda, but at least for now Volkswagen can claim the safety initiative amongst the common, small cars that dot its product line. While Volkswagen moved ahead of Toyota to become the world’s largest automaker three years ahead of schedule, it still needs to find a way to solve its persistently weak US operating presence. Sales were up 2.4 percent in July, but are still down by 1.9 percent year to date in a market that is up by 5 percent. Not only does Volkswagen trail the big guys — Toyota, Chevrolet, Ford, Honda and Nissan — but it is begin beaten by Hyundai and Kia as well as Subaru, one the market’s smallest players. Volkswagen’s Jetta, Passat and Golf families are its three top selling model lines, but sales of its Tiguan and Touareg crossovers are of little consequence in a market heavily tilted toward all things SUV. However, that may begin to change when Volkswagen begins building its seven-passenger CrossBlue utility vehicle by the end of 2016.